Our products are developed and tested under highest conditions, being certified by all necessary standards of quality, in order to meet the rigorous expectations of our customers. The selection of our suppliers and manufacturers is based on careful screening processes that guarantee excellent products. Let’s face it, when it comes to supermarket bought coffee, you are not satisfied with the results. This original design French press for coffee and tea will give you that coffee shop sensation after every delicious cup, while at the same time being the healthier choice! The extra-resistant materials and elegant lines, alongside the large capacity of the container, make this coffee maker one of the top items your home absolutely has to have! 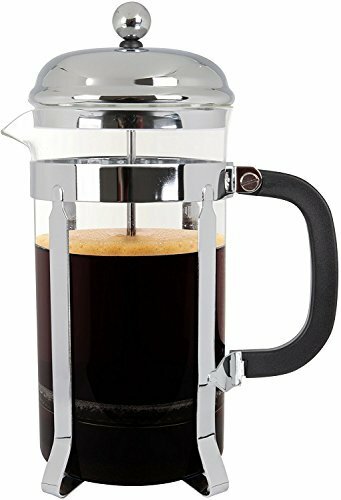 ADD TO CART NOW and you’ll fall in love instantly with this original French press for coffee and tea! WHAT YOU NEED: If you're a true coffee connoisseur, you definitely understand how important it is to have the proper tools for enjoying the perfect cup of coffee each morning. For the ultimate coffee drinking experience in the comfort of your own home, we offer the perfect solution! PREMIUM QUALITY MATERIALS: This French press coffee maker is made from superior quality, extra-durable materials, guaranteed to withstand the test of time. The combination of 3-part stainless steel plunger and heat-resistant borosilicate glass are extremely reliable, that's why we are backing our product with a lifetime warranty! LARGE CAPACITY: Unlike similar products on the market, the Lovely Home coffee press has a large capacity, being able to produce no less than 8 cups of coffee or tea and a total of 32Oz/1L per serving! Stop using impractical and time-consuming presses while having house guests, and always be prepared to provide delicious coffee brews! EXCELLENT QUALITY: Whether it's coffee or tea, you need a tool that will extract and fully release every ounce of intense flavor which comes within those roasted beans or herbs, and this French press will do the job perfectly. The simple brewing process will leave you with the smoothest, most aromatic cup of coffee or tea you've ever tasted! ORIGINAL GIFT IDEA: Order this amazing French press for yourself or as a unique and thoughtful birthday, Christmas or housewarming present for a close friend or relative, and you'll surely win their appreciation! The Lovely Home French press also comes with a BONUS of 2 extra replacement screens included! If you have any questions about this product by LovelyHome, contact us by completing and submitting the form below. If you are looking for a specif part number, please include it with your message.